Virginia National Ballet (VNB) presents the World Premiere of “Aladdin,” choreographed by visionary Artistic Director Rafik Hegab. This exciting event will be a magical journey through exotic lands with gorgeous scenery, costumes, and fabulous choreography and dancing by VNB’s elite professional company of fourteen award-winning international dancers. Order your tickets early! 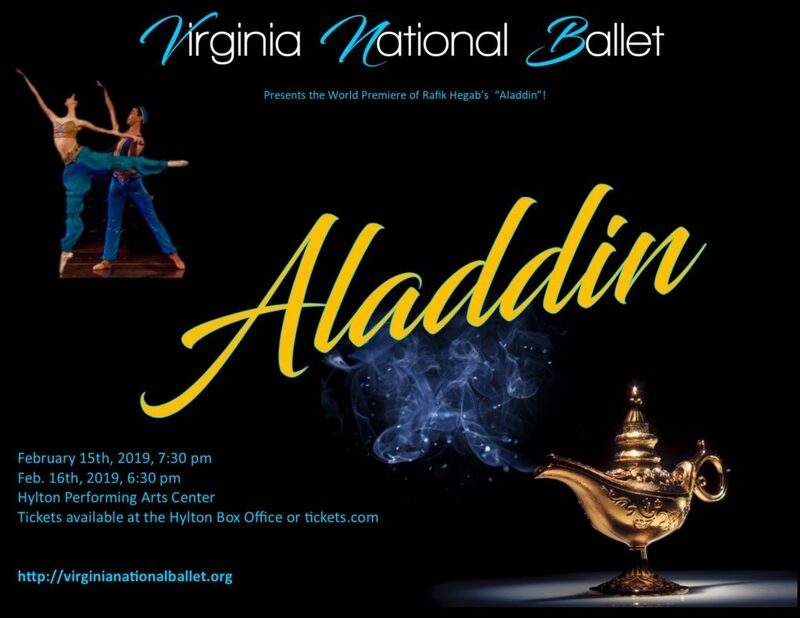 Two performances only, at the Hylton Performing Arts Center, on Saturday, Feb. 16 at 2:00 and 6:30 p. m..
Don’t miss the World Premiere of “Aladdin” choreographed by Virginia National Ballet’s visionary Artistic Director Rafik Hegab! Follow Aladdin and Jasmine on their exciting adventure in the famous story from Arabian Nights. Rafik Hegab is a master story teller through his choreography, and always lavishes audiences with productions featuring beautiful dancing, outstanding choreography, and gorgeous sets and costumes.